It’s kind of odd that each job panned out that way, but it works for me—I’ve always said that with a little planning, bringing my lunch to work is an easy way for me to eat healthy and keep my weight in check. Related Link: Find out the 5 secrets of slim people here. 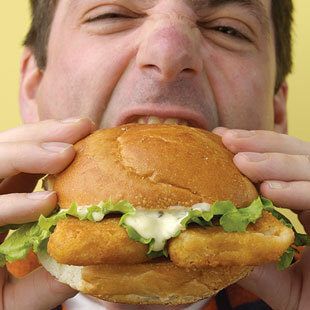 As you can imagine, I wasn’t too surprised when a recent CareerBuilder poll reported that 44 percent of American workers have gained weight in their current jobs—and blame eating lunch out as a culprit. If you’re among that 44 percent, try brown-bagging it—even if it’s only a few days a week. 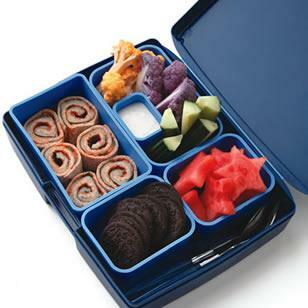 (Click here to find quick, packable, low-cal lunch ideas, including this Pizza Roll-Up Bento Lunch.) Or if you’re more like me and already pack a lunch five days a week, use this delicious lunch idea to shake up and freshen your routine. Active time: 15 minutes | Total: 15 minutes | To make ahead: Cover and refrigerate the pizza roll-up for up to 1 day. 1. Place tortilla on a plate and spread pizza sauce over it. Top with an even layer of spinach and sprinkle cheese on top. Microwave on High until the cheese is just melted, about 45 seconds. Carefully roll the tortilla up. Let cool for 10 minutes before slicing into pieces, if desired. Pack the slices in a medium container. 2. Pack cucumber and cauliflower in another medium container. Nestle a small, dip-size container among the vegetables and add dressing. 3. Pack watermelon in one small container and cookies in another small container. Per serving: 419 calories; 11 g fat (2 g sat, 1 g mono); 14 mg cholesterol; 65 g carbohydrate; 16 g protein; 6 g fiber; 679 mg sodium; 415 mg potassium. Nutrition bonus: Vitamin C (60% daily value), Vitamin A (25% dv), Calcium (21% dv), Iron (15% dv).